I hope that what I'm about to say doesn't say mean, as I mean with the utmost sincerity; What happened to Michael Keaton? If you look at his output during the 80s, few had his track record. Night Shift, Mr. Mom, and Batman are all classics. He continued to star in big-budget movies throughout the 90s, but other than Batman Returns and the underrated Multiplicity, most of these films are forgettable. Am I the only one who misses the bouncy, energetic Michael Keaton from these movies? His recent stuff has been far too serious, and that's why it's great to go back and re-visit another classic from the 1980s, Beetlejuice, which has just premiered on Blu-ray Disc. As Beetlejuice opens, we meet Adam (Alec Baldwin) and Barbara Maitland (Geena Davis). They are a warm and loving couple who run a hardware store in a small (presumably New England) town. They have decided to spend their two week vacation at home, where Barbara will hang wallpaper and Adam will work on the scale model of the town which he is building. While running an errand to their store, they are killed in a car wreck. But, they don't know that they are dead at first. They find themselves back in their house, but they are unable to leave. A tome entitled "Handbook for the Recently Deceased" doesn't offer much help. As if being dead isn't bad enough, an obnoxious family from New York -- Charles (Jeffrey Jones), Delia (Catherine O'Hara), and Lydia (Winona Ryder) -- move into the house and begin to redecorate. Adam and Barbara learn that they must remain in the house for 125 years, and that they should haunt the living to get rid of them. When this doesn't work, they respond to an ad from "Betelgeuse" (Michael Keaton), a self-proclaimed "Bio-exorcist". But, The Maitlands soon learn that Betelgeuse is uncontrollable and dealing with him may be worse than living with the living. As more home video companies embrace Blu-ray Disc, we're seeing an increase in the number of catalog titles being released, and few of these films have withstood the test of time as well as Beetlejuice. Rarely do we see a film where so many great elements come together. This was only Tim Burton's second feature film, but the director clearly stamps his own person style all over it. The bizarre characters, the sue of black & white stripes, the morbid sense of humor, these would all become Burton's trademarks. (A few years later when we saw The Nightmare Before Christmas, the similarity in style between that film and Beetlejuice was unmistakable.) Growing out of Pee Wee's Big Adventure, it was here that we learned that Burton had a gift for taking the everyday world and turning it on its side...and then rolling it down a hill. The look and feel of this film has been duplicated many times since (see Pushing Daisies), but there's been only one Beetlejuice. And when we think of Beetlejuice, it is usually the look of the film which comes to mind, but the story should not be discounted. The concept by Michael McDowell, Warren Skaaren, and Larry Wilson that the ghosts are the good guys is an incredibly clever one and it immediately places the film into a realm with which we aren't familiar. We've seen plenty of movies where the ghosts are trying to get the living to leave the house, but rarely have we sided with the ghosts. And then we have the concept of a "Bio-exorcist" -- that idea alone should win the script kudos. While watching Beetlejuice, many may overlook the fact that while all kinds of wild things are happening in the foreground, the movie makes a very poignant point about death and the fear of the unknown. As if all that weren't enough, just look at the cast of Beetlejuice. From Alec Baldwin to Robert Goulet, this is a top-notch troupe of actors and every performance is memorable. Given the outlandishness of the title character, it truly says something about the cast that we can remember the other performances, such as Glenn Shadix as Otho and the neurotic Catherine O'Hara. But, of course, it's Michael Keaton as Beetlejuice who steals the show. Although he's only in less than 20% of the movie, Keaton's over-the-top performance is a memorable one and people still quote the line about The Exorcist to this day. (Although, the scene where he tricks the fly is still my favorite.) Beetlejuice is one of the most original characters of the last 25 years, and one has to wonder why a sequel (which could have explored his past) was never made. Do there need to be more goth comedies? I don't know about that, I but I do know that Beetlejuice is in a league of its own. Few films combine ghosts, shrimp-monsters, and conga dancing in the way that this one does, and that's why it remains a classic it this day. And it makes us want funny Michael Keaton to return. 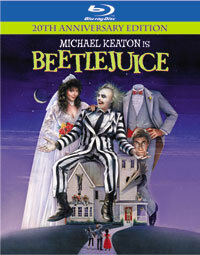 Beetlejuice is said three times on Blu-ray Disc courtesy of Warner Home Video. The film has been letterboxed at 1.78:1 and the Disc contains a VC-1 1080p HD transfer which runs at an average of 25 Mbps. The box claims that the aspect ratio is 1.85:1, but it clearly looked like 1.78:1 on my screen. The image is sharp and clear, showing no distracting grain and no defects from the source material. The image is a bit dark, but the colors do look good, especially reds and blues. The detail level is acceptable, but this simply doesn't have the pristine look of other releases on Blu-ray. The Disc houses a Dolby TrueHD 5.1 audio track which runs at 48 kHz and an average of 1.7 Mbps. This track provides clear dialogue and sound effects. The stereo effects are OK here, as they show a nice amount of detail and separation. Danny Elfman's memorable score sounds great and fills the speakers. The surround sound is simply absent in some scenes, but it really comes to life in moments such as the sandworm attack. Chapter 9 offers a good example of how the audio can shine here. The Beetlejuice Blu-ray Disc offers an unusual assortment of extras for a "20th Anniversary Edition". The only extras actually related to the movie are the THEATRICAL TRAILER and Music-only Track. The other extras are three episodes of the Beetlejuice animated television series. These are presented in their original 1.33:1 aspect ratio. These shows look like VHS quality, as they are riddled with black spots and the animation is jittery at best. While the shows are an interesting spin-off of the movie, I would have much rather seen a making-of or something related to the film.